Chair side Economical Restoration of Esthetic Ceramics . 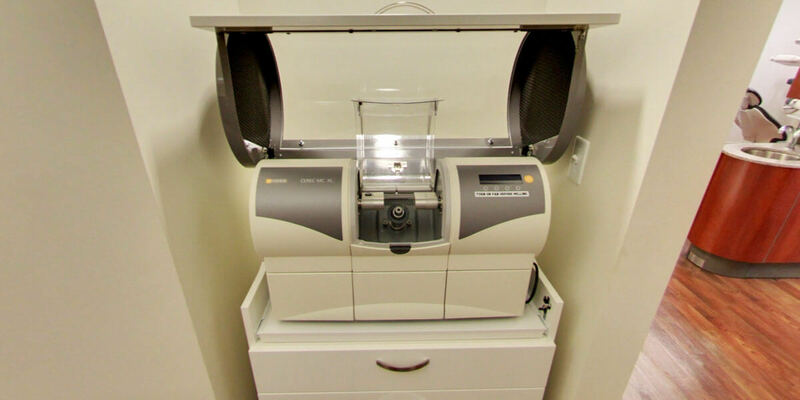 CEREC® Same Day Dentistry Technology is one of the most exciting breakthroughs in modern dentistry. CEREC® is a CAD/CAM (Computer-Aided Design and Computer-Aided Manufacturing) system that delivers superb quality porcelain restorations quickly, precisely and efficiently. High-tech aside, it’s what you don’t see that’s important: no more mercury fillings. With CEREC® restorations, your smile stays beautiful and natural-looking. After decayed or broken areas of the tooth are corrected by the dentist, an image (scan) is taken of the prepared tooth and the surrounding teeth. This image, called a digital impression, draws the data into a computer. Next, proprietary software is used to create a replacement part for the missing areas of the tooth, essentially creating a virtual restoration. Stains and glazes are fired to the surfaces of the milled ceramic crown or bridge to correct the otherwise monochromatic appearance of the restoration.